This deal is a very hot seller. LivingSocial has already sold over 575+ vouchers at the time of this post. The aromas of grilled ginger, minced scallion, and meats mingle at Pho 99, which specializes in hearty bowls of pho. See the full menu here to find out what’s in store! Appetizers include: barbecue prawns, spring rolls, chicken wings, and more! After the chef strains out the spices and bones for anyone who hasn’t ordered it extra crunchy, the soup should be salty, slightly oily, and piping hot. 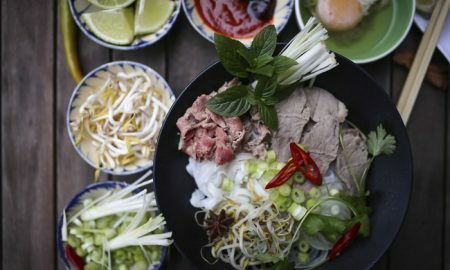 The heat isn’t just there to warm the belly: it cooks the delicate rice noodles and lace-thin slices of beef added to pho bo—perhaps the most popular style—as it hits the table. At most eateries, diners will share or fight over a plate of sprouts, jalapeños, lime, and fresh basil, which add little smacks of crunch, spice, and acidity. These garnishes are decisively Asian additions to a meal that, like several of Vietnam’s most famous dishes, arose out of French colonial occupation. The dish and its name are widely believed to have been adapted from the humble French stew known as pot-au-feu, designed, like pho, to make the most of inexpensive cuts of meat that would be difficult to prepare without long simmering. Promotional value expires 120 days after purchase. Amount paid never expires. Limit 1 per person, may buy 1 additional as gift(s). Valid only for option purchased. May be repurchased every 30 days. Limit 1 per visit. Limit 1 per table. Merchant is solely responsible to purchasers for the care and quality of the advertised goods and services.